Mysore is a city in the state of Karnataka and together with Bangalore a very important touristic drawcard. Mysore is famouse for its rich culture and good silk. Tourists also come here to experience the famous Dasara festival. But just the amazing Mysore Palace Ground with its beautiful palace and lush gardens. The Mysore Palace reminds us of the rich past of this city as the capital of the former Kingdom of Mysore. On the temple grounds you will also find the beautiful Sri Bhuvaneswari Temple with it golden entrance and carefully decorated bellshaped ornaments. 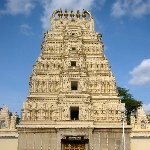 The Sri Bhuvaneswari Temple is enriched with colourful little Hindu statues at the site of the Gopuram, or gateway tower. The photos of the temple are amazing also because it was a beautiful day and the sun reflected beautifully on the yellow and golden ornaments and silk drapings of the statues. The Mysore Palace Ground is really peaceful and there is very unique atmosphere. People and cows walked sidelines towards the Palace and I was so lucky to get this beautiful picture of the Mysore Palace with this Indian cow posing in front of it, priceless! 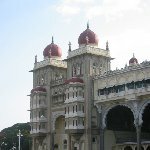 Did you enjoy Pictures of the Mysore Palace in India and have you been on a holiday in Mysore, India? Panoramic photos of the Mysore Palace Ground. Side angle photo of the Mysore Palace. Front view of the Mysore Palace, India. Walking towards the Mysore Palace, Karnataka, India. Liked: Beautiful place, very pieceful.